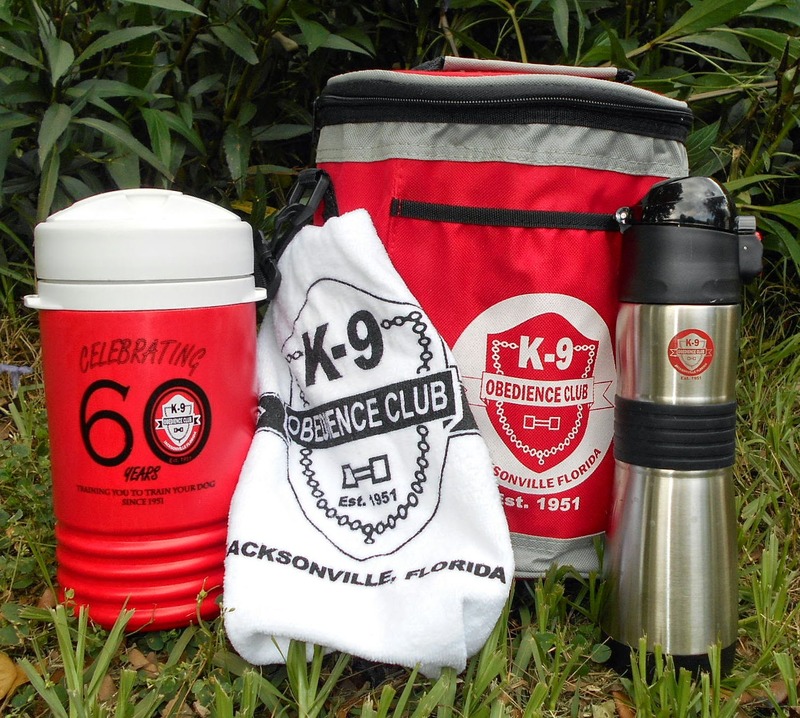 Last weekend K-9 Obedience Club of Jacksonville held obedience and rally trials. Since Jedi and I are focused on conformation, we don't compete in obedience or rally. (Seriously, we're confused enough as it is!) But K-9 is my club so I went out to cheer on the members who do compete. While there, I bought a bunch of raffle tickets. Regular readers know I'm a sucker for raffles. (I told Hubby I was supporting the club.) There were some really awesome prizes so I bought a whole lot of tickets and crossed my fingers. It worked! We walked away with a basket full of dog toys and treats, a club logoed lunch bag and thermos combo, and a big blue jumble labeled "assorted agility equipment." Look at that happy face! It rained all week so we couldn't check out the agility equipment right away. We eventually opened it up in the hallway to see what was what. Boy did we make out! One of the items is a 17-foot tunnel. Jedi is thrilled and runs in and out of it with glee. I love that goofy grin on his face as he comes out of the tunnel. 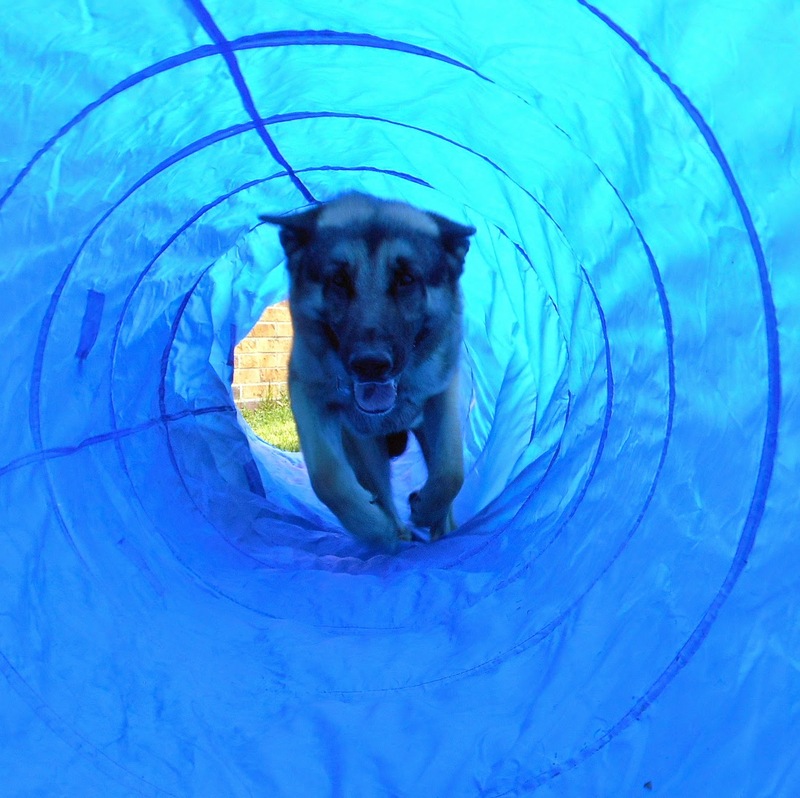 The second item was a 4-foot tunnel with a 12-foot chute on the end. I thought Jedi might be hesitant running through the chute since he can't see out the back end. I was wrong. He comes out full speed with that same goofy grin. The third item is a PVC stand for a tire jump, sans the tire. Hubby thinks we can make a tire out of corrugated tubing instead. I guess that's a project for next weekend! Y -- You Should Know . . .
N -- Name That Dog!